Few Americans today would have difficulty imagining a United States where the citizens disagree over the wisdom of immigration, question the degree to which Mexicans can be fully American, and dispute about the value of religious pluralism. But what if the America in question was not that of 2014 but rather the 1830s and 1840s? Along with being a high point of anti-Catholic nativism, these two decades witnessed the Texas Revolution, the US annexation of Texas, violence in US cities against Catholic immigrants, and the Mexican-American War. As Americans struggled to negotiate their identity as a people in terms of race, religion, and political culture, the war with Mexico clarified and for one century afterward cemented American identity as a Protestant, Anglo-Saxon republic. Manifest Destiny held that American Anglo-Saxons, by reason of their cultural and racial superiority, were destined to overtake the western hemisphere. This Anglo-Saxonism was not so much based on attributes like skin color, as it was on unique attitudinal traits that predisposed Anglo-Saxons to be the most effective guardians of liberty. From this innate love of freedom had sprung Protestantism and republicanism—the religion and government for free men. While the majority of Americans condemned a series of mob attacks against Catholic convents, churches, and schools in Boston and in Philadelphia, they nevertheless agreed with nativists that Catholicism was incompatible with representative—or what they called, “republican”—government. Politically unstable Mexico, they said, was proof of this. When the United States and Mexico went to war in 1846, doubts quickly surfaced about the patriotic fortitude of foreign-born, Irish-Americans in a war against a Catholic nation. Irish immigrant soldier John Riley fled the US army on 12 April 1846, about two weeks before the first battle of the war. American authorities suspected that in September 1846 he was the leader of a group of mostly Irish and Catholic deserters at the Battle of Monterey. These rumors were true, and in late 1847 the US Army captured the San Patricios, or Saint Patrick Battalion. In the United States, debate ensued over the San Patricios’ motives and goals. At stake was the question of immigrant Catholic loyalty to the United States. So, what were the factors in the San Patricio desertion? Abuse by nativist American officers was one of them. For a given crime, officers would sometimes merely demote native-born soldiers while imprisoning, whipping, or dishonorably discharging foreign-born men. Atrocities, church looting, and violence against priests by some American troops aggravated the fear that the Protestant United States was attacking not just Mexico but the Catholic faith. The causes of this desertion, however, were not a one-sided affair. Mexican propaganda enticed Americans to leave their ranks. One broadside was addressed to “Catholic Irishmen” by General Antonio López de Santa Anna but the writer probably was Riley. It beckoned Americans to “Come over to us; you will be received under the laws of that truly Christian hospitality and good faith which Irish guests are entitled to expect and obtain from a Catholic nation.” It then asked, “Is religion no longer the strongest of all human bonds? Can you fight by the side of those who put fire to your temples in Boston and Philadelphia”? It is most accurate, then, to say that while religion was involved in the defection, most of the San Patricios deserted because of intense abuse by officers, not for love of Mexico or the Catholic Church. This includes Riley. In all, 27 San Patricios were hanged. 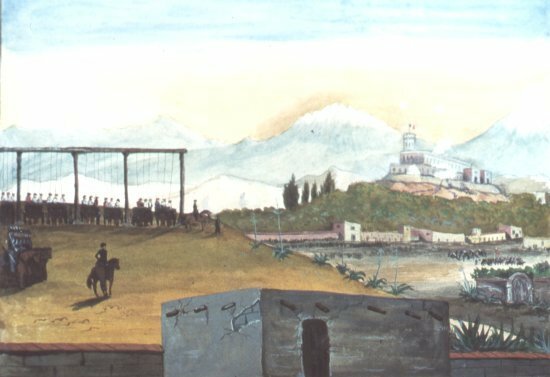 Hanging of the San Patricios following the Battle of Chapultepec. Painted in the 1840s by Sam Chamberlain. Public domain via Wikimedia Commons. The capture and punishment of the San Patricios may have been dramatic, but the questioning of Catholic loyalty was just one small part of religion’s interplay with the war. Religious rhetoric constituted an integral piece of nearly every major argument for or against the war. This civil religious discourse was so universally understood that recruiters, politicians, diplomats, journalists, soldiers, evangelical activists, abolitionists, and pacifists used it. It helped shape everything from debates over annexation to the treatment of enemy soldiers and civilians. Religion also was the primary tool used by Americans to interpret Mexico’s fascinating but alien culture. More than any other event during the nineteenth century, the Mexican-American War clarified the anti-Catholic assumptions inherent to American identity. At the same time, from the crucible of war emerged an American civil religion that can only be described as a triumphalist Protestant and white, anti-Catholic republicanism. That civil religion lasted well into the twentieth century. The degree to which it is still alive today in current debates over Latino immigration is debatable, but one can hardly miss the resemblance and connection between the issues of the 1840s and those of 2014. John C. Pinheiro is Associate Professor of History at Aquinas College in Grand Rapids, Michigan. He has written two books on the Mexican-American War. His newest book is Missionaries of Republicanism: A Religious History of the Mexican-American War. Subscribe to only religion articles on the OUPblog via email or RSS. “… most of the San Patricios deserted because of intense abuse by officers, not for love of Mexico..” Lets remember when Protestantism came to Ireland> it was our distaste for it that Irish ran to Catholicism.>as Norman Davies says in his book ‘The Isles’>there was no religious persuasion in Ireland prior to the 1540s. “..the resemblance and connection between the issues of the 1840s and those of 2014. According to ‘The Mex-Am Experience’ by de Garza only %1 of Mexico was in the newly acquired American Southwest. At a time when Mexico was 8 million people there was roughly 80,000 Mexican subjects in the Southwest, 1840s. (240,000 American Indian). The LatinoAmericano population in the USA is more significant now but the Muslim extreamism battle vs AngloSaxondom has stolen the wind from alot of other discontented movements. Although I’ve learned a lot about the Mexican American War we didn’t spend much time on the sentiment towards Catholics during the time period. However, given the short history of a new form of government and the controversy around manifest destiny, it’s not surprising there was not a lot of trust.